If I told you that TrustWorkz® is successful because of the dynamic and incredible individuals that we employ, this statement would be 100% true. If I told you that TrustWorkz® is successful because we have an extremely supportive and collaborative culture, this would also be 100% true. We are very much a team. We are a team that thrives on the relationships that we have, not only with our clients, but with each other. We truly enjoy each other’s company and we try to get together as often as possible to spend time together outside of the workplace. 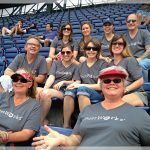 On May 22nd we all spent the day at Turner Field in Atlanta to watch an Atlanta Braves game. It was a beautiful day for an outdoor activity and we were fortunate that most of the company could attend. We also had t-shirts made for the occasion and this was a big hit. Yes, we struck a pose. Beautiful day for a game! Involved In The Game – NOT! At first I noticed lots of idle chatter about clients and the exchange of different tips and tricks that help us all to do our jobs a little better. I totally expected this. We all work in different locations and so I knew that the WebOps® would use this opportunity to compare notes. What I didn’t expect was that within minutes the conversations turned more personal. 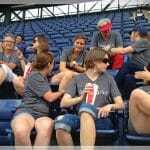 Everyone seemed to be aggressively trying to get to know as much about their fellow team members as possible within the allotted nine innings! So, we have a closer team after the outing…and perhaps this is nothing new or earth-shattering. What is new, and perhaps worth a gold star is that we have an INCREDIBLE team who all understand and appreciate the value of relationships. At our core we are all empathetic individuals who strive to do work that matters for our clients. Also at our core is that same empathy that seems to breed a strong desire to connect with and help other fellow members of the TrustWorkz® team. We are an empowered and edified group because of this. 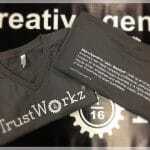 I am proud of TrustWorkz® and proud of every individual who makes up the collective. Empowered and edified from within…this will come to be known as a paramount ingredient to our success. 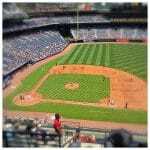 I know this because we went to a Brave’s game and had a lot of fun together!